In May, eight young professionals from Rwanda were on campus at Cummings School for a weeklong workshop focused on the intersection of human, animal, and environmental health. Offered as part of the new Tufts-UGHE One Health Fellowship—and created in collaboration with the University of Rwanda and the University of Global Health Equity—the intensive workshop was part of a six-week program designed to help the multidisciplinary group prevent and respond to disease outbreaks in their home country. The program was made possible through the generous support from Cummings Foundation, the charitable foundation established by Bill and Joyce Cummings. “The Cummings family has a special interest in the postgenocide recovery and rebuilding of Rwanda,” said Joyce Vyriotes, deputy director at Cummings Foundation. 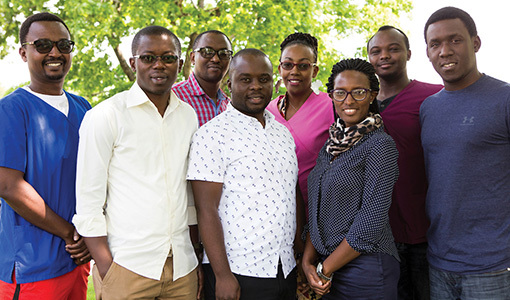 “We’re proud to support a project that trains Rwandan professionals in a One Health approach to tackling the challenges of infectious disease.” The fellowship culminated in a group trip to the fifth international One Health Congress in Saskatoon, Canada. One day on campus, Susan Murcott, a water engineer and research scientist from MIT, led hands-on water-testing exercises. Using a simple toolkit, the Rwandan fellows could use their body heat to grow up enough bacteria in their water samples to detect E. coli and other bacteria. Fellow Mediatrice Uwanyirigira, a laboratory technician at the University of Rwanda, said the tools could lead to better water testing and public education. Cummings School also matched each fellow with a mentor at a U.S. public-health organization for four weeks. Uwanyirigira was paired with Katey Pelican, a professor at the University of Minnesota’s veterinary school and a technical officer for USAID’s one-health workforce development project. Uwanyirigira trained on an interactive process map for coordinating effective outbreak response planning across organizational and disciplinary lines.